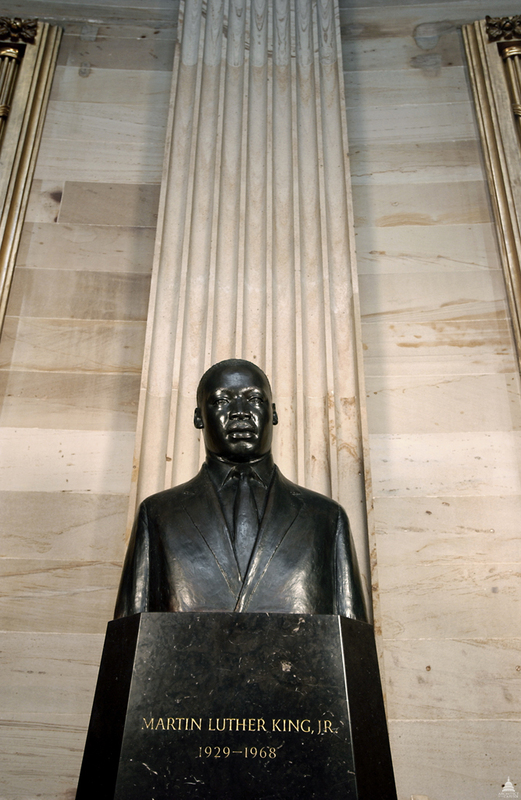 The bust of Dr. Martin Luther King Jr. has been on display in the Capitol Rotunda since 1986. The bronze sculpture is 36 inches high on a 66-inch high Belgian black marble base. Martin Luther King Jr. born in 1929 to a family of pastors and civil rights leaders, received a B.A. degree from Morehouse College in 1948, a B.D. degree from Crozer Theological Seminary in Pennsylvania in 1951 and a Ph.D. from Boston University in 1955. He returned to Montgomery, Alabama, to work for civil rights while serving as pastor of the Dexter Avenue Baptist Church. Already a member of the executive committee of the National Association for the Advancement of Colored People (NAACP), he gained national recognition as a leader of the Montgomery Bus Boycott. In 1957, he founded and was elected president of the Southern Christian Leadership Conference. He traveled extensively, giving over 2,500 speeches, and wrote five books as well as numerous articles. During his 1963 incarceration in Alabama he wrote his famous "Letter from a Birmingham Jail." He planned drives in Alabama for the registration of African-Americans as voters; he directed the peaceful march on Washington, D.C., of 250,000 people, to whom he delivered his "I Have a Dream" address in 1963; and he counseled Presidents John Kennedy and Lyndon Johnson. His actions brought about consideration and passage of the Civil Rights Act of 1964 and the 1965 Voting Rights Act. Awarded the Nobel Peace Prize in 1964, Dr. King was the youngest man to receive that honor. On April 4, 1968, while standing on the balcony of his motel room in Memphis, Tennessee, he was assassinated. The bust of Dr. Martin Luther King Jr.'s head and shoulders depicts Dr. King in a contemplative and peaceful mood, looking slightly downward. His face is smoothly modeled, in contrast to the textures of his hair and of his jacket and tie. The pedestal was designed by the sculptor to follow the lines of the shoulders of the bust, creating a unified shape and enhancing the monumental effect. The bronze sculpture is 36 inches high on a 66-inch high Belgian black marble base. On December 21, 1982, the Congress passed House Concurrent Resolution 153, which directed the procurement of a marble bust "to serve to memorialize [Dr. King's] contributions on such matters as the historic legislation of the 1960s affecting civil rights and the right to vote." Senator Charles McC. Mathias, Chairman of the Joint Committee on the Library, the congressional committee overseeing the procurement, said at the unveiling that "Martin Luther King takes his rightful place among the heroes of this nation." Because the bust would be such an important and visible work of art, the Joint Committee on the Library decided to have a national competition to select a sculptor. The competition was conducted by the National Endowment for the Arts, using a panel selection process that the Endowment had successfully developed over the previous 20 years. Mrs. Coretta Scott King agreed to serve on the advisory committee and to advise the panel of "the salient qualities of Dr. King's character and physical expression which the Panel should consider in evaluating the qualifications of the competitors." In December 1984, the panel selected John Wilson of Boston, Massachusetts; Elizabeth Catlett of New York City and Mexico; and Zenos Frudakis of Philadelphia, Pennsylvania, as finalists in the competition. Each sculptor received a $500 grant to create a maquette (i.e., a model) for the panel to review before making its final decision. The Chairman of the Arts Endowment was proud to point out that "this was the first time that Arts Endowment was asked by Congress to prove the expertise of its peer review process, which specifies artistic excellence as its primary criterion to select an artist to create a work of art to be placed in the U.S. Capitol." After reviewing the maquettes at a special meeting on April 15, 1985, the committee selected John Wilson; the artist was awarded a $50,000 commission to cast the model in bronze. The bust was unveiled in the Rotunda of the U.S. Capitol on January 16, 1986, the 57th anniversary of Dr. King's birth, by Mrs. King, accompanied by their four children and Dr. King's sister. African-American sculptor John Wilson was born in Roxbury, Massachusetts, in 1922. After graduating from Tufts University in 1947 he studied in Paris and Mexico City. He served as professor of art at Boston University from 1964 to 1986. He won prizes in national exhibitions from 1951 to 1969. His work is in the collections of the DeCordova Museum, the Smith Museum of Art, the Museum of Modern Art, and the University of Wisconsin. His most notable work, Eternal Presence, is at the Museum of the National Center of Afro-American Artists in Boston. He also won the 1983 competition for the statue of Dr. Martin Luther King Jr. for Buffalo, New York.